Men frequently the present to plastic surgeons to reshape their noses. 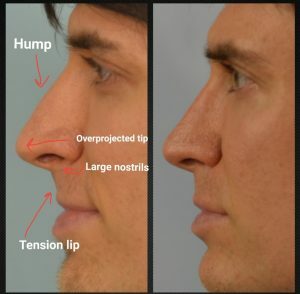 Some of the more common complaints in male rhinoplasty are a dorsal hump, wide bridge of the nose, wide and droopy tip, and wide nostrils. 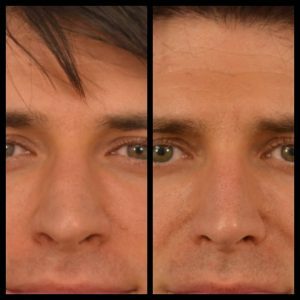 In general, the goal of male rhinoplasty is to produce a straight masculine profile. However, some men prefer to have to have a slight slope or a supratip break. The patient below under rhinoplasty elsewhere before. He presented complaining of a residual dorsal hump, overprojected nose, large nostrils, and a wide nose. His result 5 years after surgery shows an improved shape of the nose while maintaining masculine features of the nose.